Regardless of the specifics of your cleansing and treatment regimen, it’s necessary that you are consistent! In order to see the results you want, make sure you follow your routine both in the morning and at night. Also remember that seasonal changes and new product updates are a vital part of the normal and needed evolution of your regimen. When you change your skincare products every few days or jump on a new treatment every week, it won’t help your skin and it may actually be detrimental. If creating a routine to adhere to is difficult, create a regular reminder for yourself (create alerts on your phone, or post sticky notes in important places). As long as the reminder motivates you and holds you accountable, it will help solidify the habit in your mind. Psychological studies show that it takes approximately 2 months (66 days) for a new habit to become automatic. So, stick with it and soon, you should be able to start your skincare routine without having to think about it. Cater to your skin type. There’s not one single skincare regimen that will work for everyone, so this is a process that requires trials and lots of personalization. When selecting your own skin-care products, you must first assess and think about your skin type - is it more oily or dry? If your face seems to always have a natural shine, chances are you’re dealing with oily skin. On the other hand, if you’re prone to flaking and your skin appears dull, you probably have dry skin. You may also have combination skin, which is a little bit of both types. Regardless of your skin type, avoid products that contain benzoyl peroxide and salicylic acid as well as other ingredients that you cannot pronounce, these are sure to be strong chemicals. These harsh, synthetic chemicals can irritate and inflame your already sensitive skin. For those with oily skin, avoid products with heavier oils and stick to water-based moisturizers. Every skin type, whether oily or dry, needs to be moisturized. Non-comedogenic, water-based products will prevent an unnecessary oil build-up and won’t contribute to clogged pores. Conversely, if you have dry skin, more emollient moisturizers may be used, but be sure to avoid fragrances and complex-chemical ingredients as well. As it may seem counter-intuitive to moisturize acne-prone skin, note that the main reason that pores become clogged is due to dead skin cells. A good moisturizer will keep your skin supple and also prevent flaking or scaling, which may add to clogged pores. When it comes to a daily skincare regimen, there is such a thing as "too much". After a certain point, your efforts may start to damage the skin instead of improving it. One of the most common ways that people tend to overdo things is with exfoliation. Exfoliating can help keep your skin looking young by removing dead skin cells, unclogging pores, and encouraging skin regeneration by stimulating collagen production. The negative side of exfoliation is that it is often done through some type of abrasive process or a chemical reaction and can lead to irritation and inflammation. This can make your breakouts worse by adding to the infection and/or cause your skin to become overly sensitive. If you have cysts or larger pimples, refrain from exfoliation until they heal. With smaller whiteheads and blackheads, limit yourself to one exfoliating session a week, and when possible choose a natural option, such as a papaya exfoliating mask. Also, monitor your skin condition. More sensitive skin should not be exfoliated more than once a month, and always use extreme caution to avoid irritation. Don’t neglect the underlying causes of your acne. Until you address the fundamental cause of your acne, your problems are likely to persist. At its root, acne is not a skin problem, it’s a hormonal problem. Therefore, if your daily skincare routine only treats the outward symptoms, you probably won’t see the results you desire. Male hormones known as androgens (or testosterone) are the most potent stimulators of the sebaceous glands, which produce sebum. Both men and women produce both male and female sexual hormones (testosterone, estrogen and progesterone). What is not commonly understood is that only 1-2% of these hormones circulate freely in the blood. The other 98% are bound to a protein called Sexual Hormone Binding Globulin (SHBG). SHBG is made in the liver and transports hormones in the blood. When hormones are carried by SHBG, they are not considered active hormones and will not cause acne. Only hormones that are not carried by SHBG are considered free or unbound. These free hormones are the ones that cause acne. The critical point to understand is that if a person’s SHBG levels are low, there are increased levels of free hormones (usually testosterone), and this leads to acne through an increased production of sebum. To address this problem, products like AcnEase® help regulate the effects that hormones have on your skin in a way that is safe, gentle, and natural. 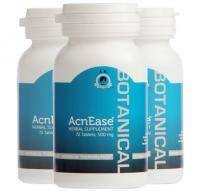 AcnEase® safely and naturally mitigates the impact of hormones on your skin and sebaceous glands, and it does not directly affect or change hormone levels. AcnEase® is unique in the fact that it has a buffering effect on the hormones’ stimulation of the sebaceous glands and therefore helps return the production of sebum to a healthier level. AcnEase® users find it easy to incorporate the treatment into their daily routine. You will notice the change in your skin’s health and appearance,which typically takes between two and four weeks. With a 96% success rate, why pass up the chance? As always, we are committed to you and helping you improve your acne. So let us know what you think in the comments. We are in this fight together, and WE ARE GO-ING TO WIN!